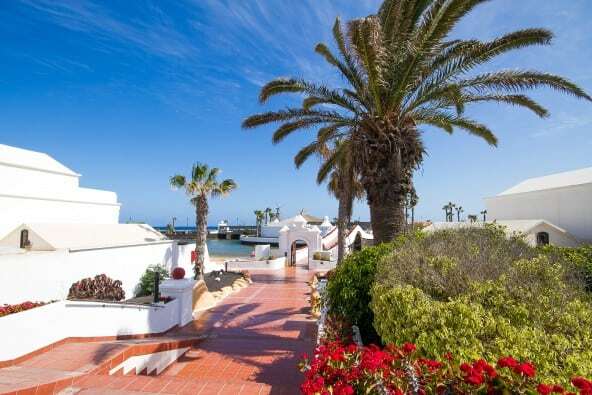 At Sands Beach Resort in Costa Teguise, a sandy crescent wrapped around a seawater lagoon is the crowning glory of a Lanzarote beachfront hotel with so much to offer. 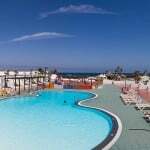 The east coast setting of Sands Beach Resort is a natural sun trap on this Canary Island blessed with all year round sunshine. The golden beach of the lagoon is not the only place to lay back and unwind, many families choose to enjoy the pool in one of the six plazas, to soak up the rays, relax and take a refreshing dip. 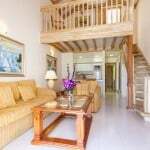 The word apartment barely begins to describe the spacious accommodation that looks out onto the swimming pools, the lagoon, the public beachfront and Atlantic Ocean beyond. From self catering to full board and from single occupancy to three bed comfort and group parties, everyone can enjoy our wide range of on-site facilities. Each apartment has its own terrace and sun loungers, and a spacious layout inside provides a real home from home with a fully equipped kitchen and the option of eating inside or out on the terrace where you can take in the stunning views. You’re here to relax so why not let Sands Beach Resort do the cooking for you? Treat the family to a visit to the Hacienda restaurant in the midst of the plazas and choose from extensive breakfast or dinner buffets, something a little more formal or just a pizza to eat in or take home to your apartment. During the day, a sandal stroll across the wooden bridge of the lagoon will take you to paradise island and the Mai Tai pool bar & restaurant. Menus ranges from all day breakfast through to lunch or a BBQ snack, all accompanied with a long cool drink. This is one of the most popular family zones and offers a children’s menu, home-made ice cream and daily activities for the youngsters around the pool, courtesy of Buddy’s Club. Lanzarote’s government takes great pride in protecting its heritage and in having a progressive approach to conservation and environmental awareness. 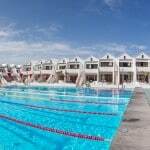 Minimising the impact of development on the natural beauty of the environment, Lanzarote limits the height of buildings and insists on a standardized white-washed finish to houses and offices. Here at Sands Beach Resort we enthusiastically embrace those values. At Sands Beach Resort we constantly strive to exceed everyone’s very different holiday expectations, and with your valued customer feedback, you can help us to achieve that aim. You’re the most important people in our lives, speak to us and we will listen.